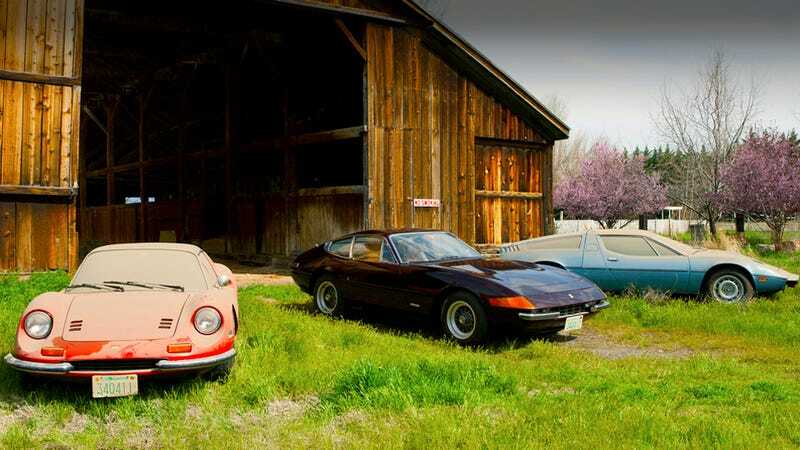 For the past several years, car collectors in Texas had heard rumors of a secret stash of near-showroom condition Italian sports car, tucked away and nearly forgotten. The rumors were true, but the mystery remains intact. The three cars — a 1974 Ferrari Dino 246 GTS with 2,910 miles, a 1972 Ferrari 365 GTB/4 Daytona with 9,752 miles and a 1977 Maserati Bora Coupe with just 978 miles — will be sold at Mecum's Monterey, Calif., auction next month after spending more than 30 years in a storage shed near Dallas gathering dust. The owner, according to Mecum, was a friend of Luigi Chinetti, the Italian racer who opened the first Ferrari dealership in the United States following World War II, and was for many years the only source of Ferrari vehicles here. The three cars in the shed all sport New Hampshire license plates registered in 1989, not far from Chinetti's home dealership in Connecticut. Why someone would park such vehicles under a blanket of dust for so long remains unknown; all we can say is that they came to light in March, popped up on eBay for a bit and have slowly caught the attention of collectors since. Mecum says the '74 Dino may be the best original example of that model in existence; all three have little if any interior decay and need minor repairs to be restored to running condition. As journalist Murray Kempton said of Sicily: "Nothing decays like progress, and nothing preserves like neglect."